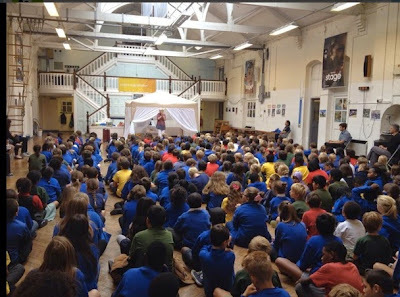 I love visiting schools (and libraries, bookshops and festivals!) to meet readers and talk about reading and writing. I offer author talks and creative writing workshops. What age group are your talks and workshops suitable for? The Adventure Island books are for 7-12 year old readers so most of my talks and workshops are designed for children in Y3-6. The Secrets of the Tombs books are for a slightly older readership (9-13). 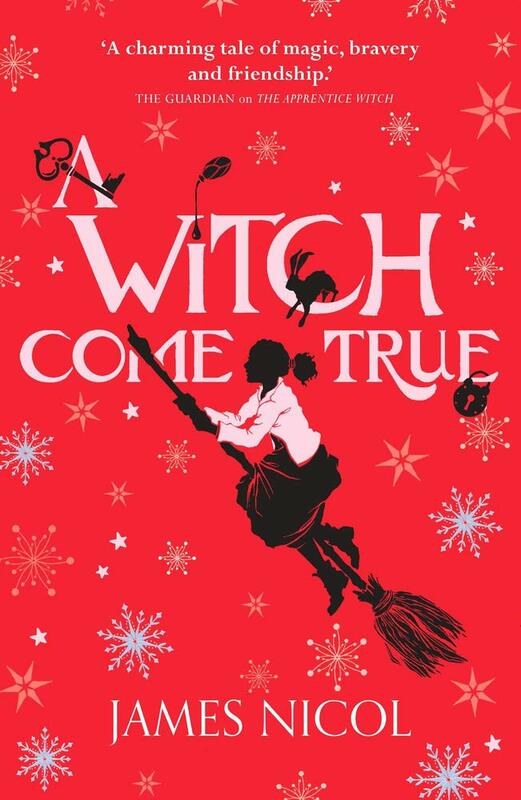 Talks based on this series are most suitable for Y5-Y8. I am also happy to run workshops for older pupils, including reluctant readers and children with special needs. 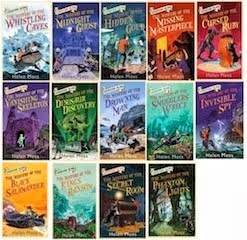 I have recently run mystery-writing workshops for a home-educating group, made up of students ranging from seven to fifteen. I'm always happy to pop in for a chat with the younger children in Reception and Y1 when I'm in a primary school. We have fun looking through Emily's investigation kit bag, cuddling Drift's stunt double, Scruffy, and talking about our favourite stories. 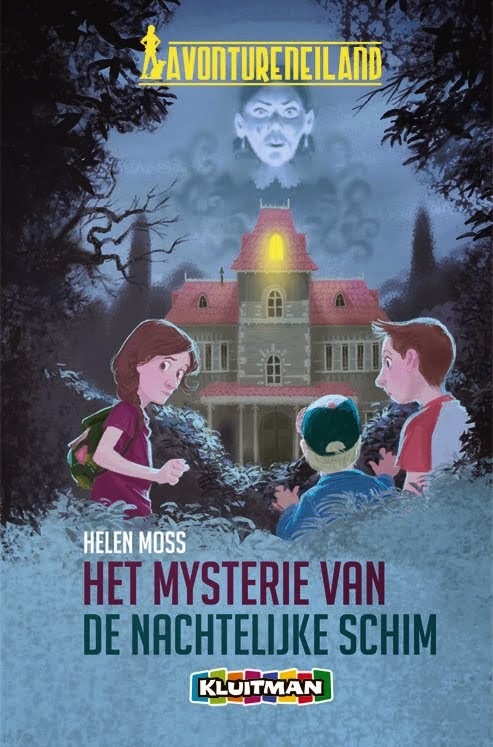 I can also read from my new Rising Stars book, The Mystery of the Green Lady, which introduces younger children to the mystery genre, with curious goings-on and clues to spot. What do you do on a school visit? I typically spend a half-day or full-day in school. 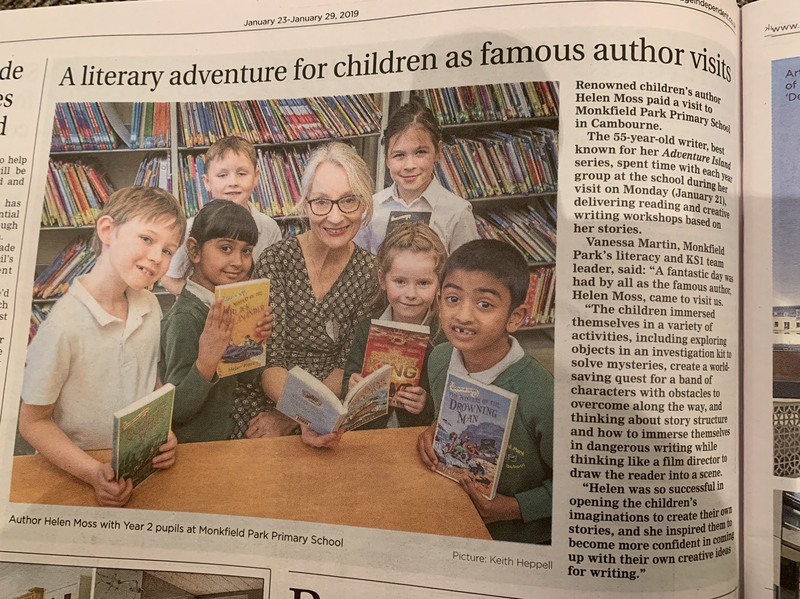 I usually start by talking to a KS2 or whole-school assembly about why I love the mystery/adventure genre and being a writer, ending with a question and answer session (30-45+ minutes). 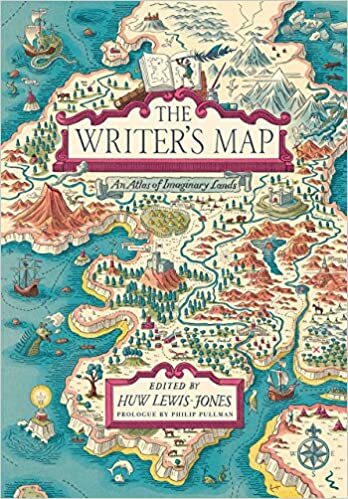 I can then spend the rest of the day leading creative writing workshops with a group of children (any number from about ten up to sixty+ students, depending on the workshop). I can offer a whole day workshop for one group of students or take one group in the morning and one in the afternoon (or we can just about squeeze three shorter workshops into a school day). What sort of workshops do you offer? I offer various workshops on creative writing and creative thinking, which I adapt to the age and number of the children. Here is a selection . . . 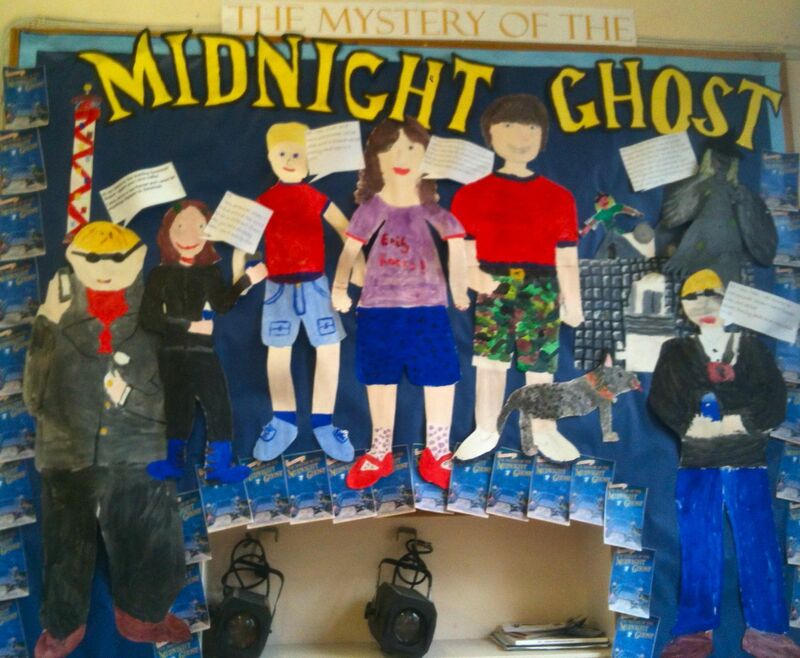 I take the children through the process of writing a mystery story; choosing a setting, plotting the crime, developing character and writing powerful prose with hooks and cliffhangers. This workshop works best with a group of about twenty or fewer children, so that I can spend time with each of them. 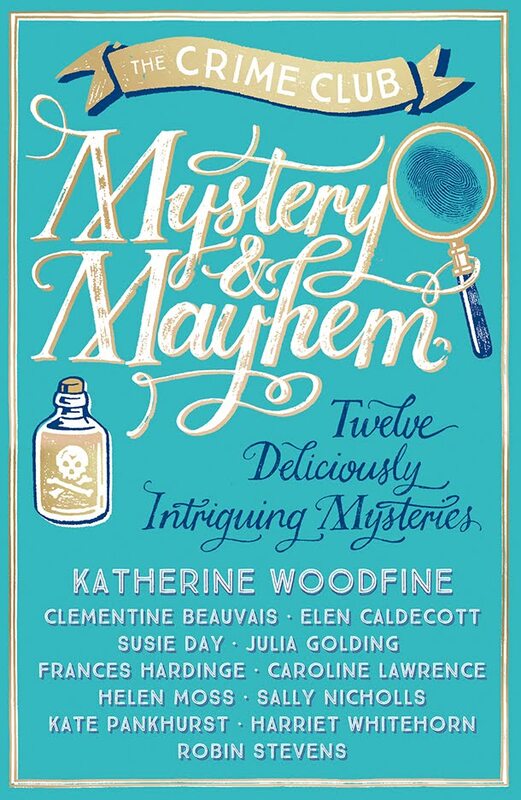 I can also do a shorter (half-day) version of this workshop with a class-sized group, called The Mystery Masterclass. This takes children through the stages of planning a mystery story, with lots of discussion and interactive tasks, but without any extended writing or editing (which can be done as a follow-up activity). We plan an Adventure Island story together, starting by choosing real "treasure" to hide, and then helping the characters solve the clues and follow the trail to the treasure. 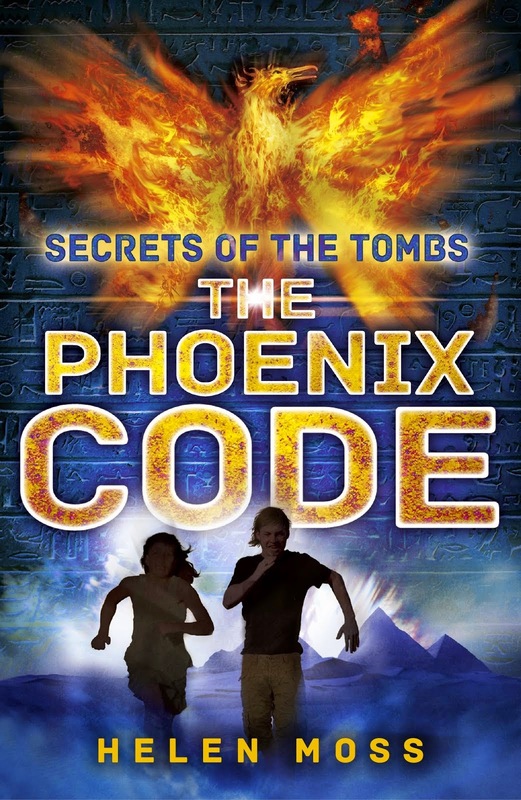 This involves code-breaking, map-reading and problem-solving, as well as working together to generate the story. As the class make most of the decisions about the direction of the story, it's different every time. This workshop involves working in groups of about 5-6 and is suitable for a class of up to around 30). Here is a lovely report of this workshop on a recent visit. Whenever possible I will bring in some real dinosaur fossils for the children to examine. This workshop is based on The Mystery of the Drowning Man. 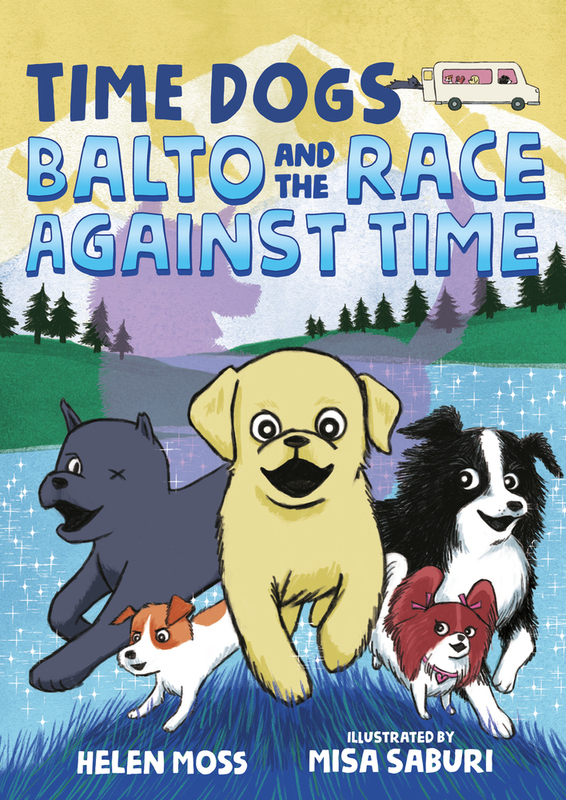 Emily, Jack, Scott and Drift rescue a man from the sea. He’s carrying no identification and has totally lost his memory, and the young investigators face one of their most baffling cases yet; who is the unknown man and how did he end up in the waves? 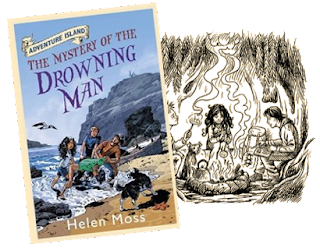 In this interactive workshop, I set the children the mission of identifying another man who washes up on the shore - alive but with no idea who they are. Imagination and powers of deduction are required to figure out the identity of the mystery person in this fun and puzzling challenge. Think Cluedo meets CSI! This workshop involves creative thinking and problem solving rather than creative writing, although a follow-up activity can be added in which children write a story about how the person ended up in the water. This workshop works best with class-size groups of around 30 students. It also works well for a mixed group of adults and children. Many children (and adults for that matter) find it easy to start a story with a great idea but then run out of steam after a few pages. This workshop aims to solve that problem by looking at the key components of story structure. There's plenty of interaction as children generate as their own ideas. When we pull the ideas out in a consequences-style grand finale, there is always a lot of laughter as the stories unfold - but however crazy they are, they'll all have a great structure! 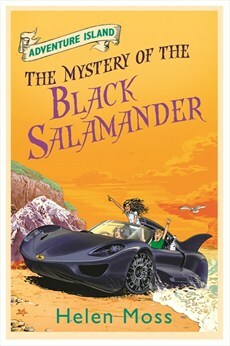 Based on The Mystery of the Black Salamander, this workshop is all about generating ideas and channeling creativity into great stories. We all come up with ideas for supercars based on properties of animals. We draw and label their fantastic features and develop stories around them. Just for fun we also come up with the world's worst car names (which more often than not involve Brussels Sprouts!). The session ends with a noisy interactive reading from the book, which highlights the use of dramatic writing in action scenes. This workshop is especially suitable as a fun activity for a large group, or to inspire reluctant readers/writers. This workshop focuses on a particular aspect of mystery/adventure story writing; getting characters in and out of perilous situations. We talk about everything from chase scenes to spying on baddies. 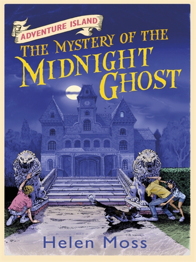 Using an example scene from The Mystery of the Midnight Ghost, I encourage children to generate their own suspenseful "dangerous writing" in intense one-minute bursts. Together we set the scene, zoom in on details, and come up with "yikes moments" to try to give our readers goose-bumps and make them jump out of their skins! 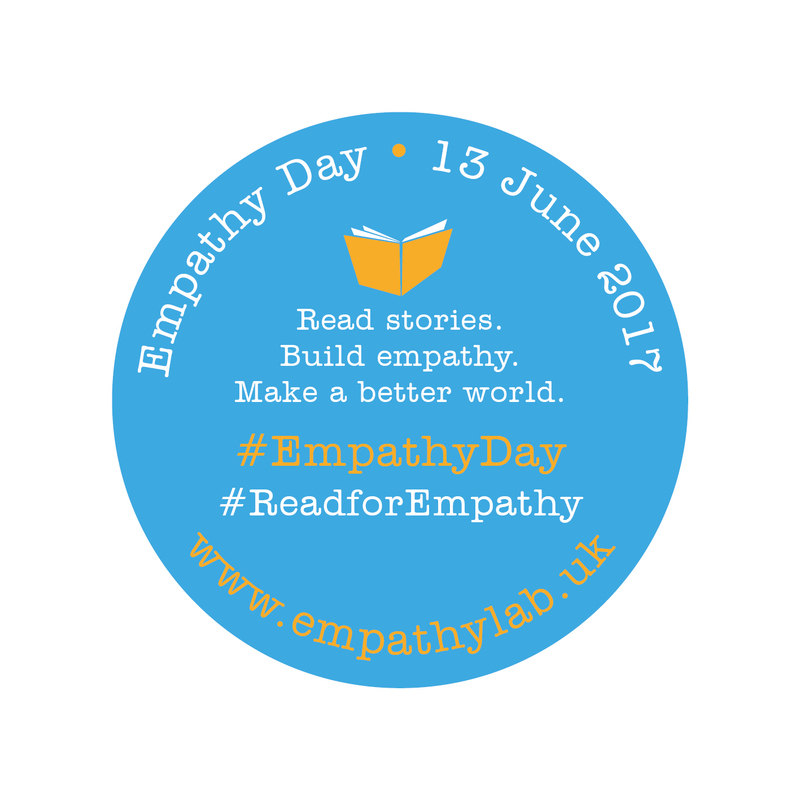 I have also developed workshops that focus on specifically on setting, character or plotting and on reading and empathy. I have also led workshops on poetry and travel writing with Y7 and 78 groups. Please ask for details if you would like to find about more about these. The Secrets of the Tombs series has an archaeological theme and I can also provide talks and workshops to tie in with topics on ancient Egyptian, Chinese and Maya civilizations. All of the 1.5 hour workshops can easily fill 2 hours with additional readings, activities and/or Q & A sessions. What will you need for your visit? I just need a laptop and projector/smartboard that can show the powerpoint presentations that I'll bring with me on a memory stick. Children will need something to write with for some of the workshops (and something to lean on if we are in the hall.) A supply of scrap paper is helpful for most of the workshops. Oh, and a cup of tea would be lovely - milk no sugar, please! Hands up if you love reading! Milton Rd Primary School on a VERY hot July afternoon! 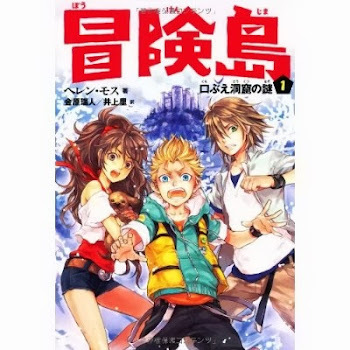 Will children be able to buy the books? Yes! At the end of my visit to the school I like to run a book stall so that the pupils can buy copies of the books that they have heard about during the day (and the rest in the two series) - and I will, of course, dedicate and sign them. 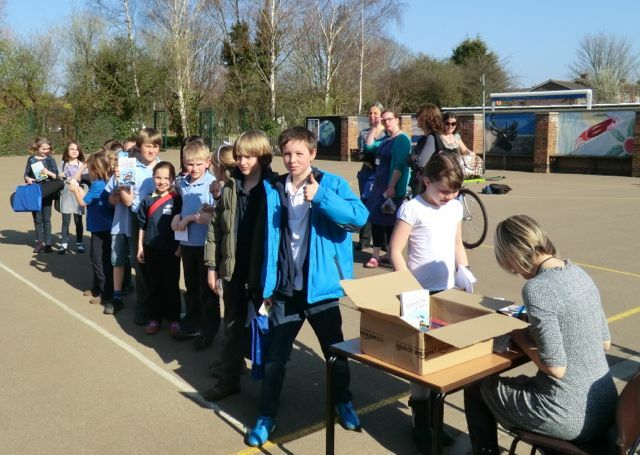 Children love a chance to own a personally signed book and the signing session is a great chance for a little chat with each child; quieter children can ask questions they may have been to shy to ask in the group. I can either bring a selection of books with me to sell or you can arrange for your local bookseller to come in and run the book sale. If you would like me to bring stock, just let me know and I'll send you a price list to send out before the visit. 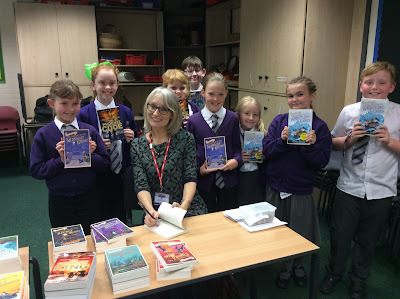 I do understand that schools may not always wish to hold a book sale as part of an author visit and that is also absolutely fine, of course! And what are your fees? For further information and to discuss fees and travel expenses, please contact me on helen(at)castlekey.org.uk. I am more than happy to work with teachers/librarians in advance to tailor just the right visit for your school. And it's always fun if the local press would like to come and take some pictures . . . I have public liability insurance and hold an Enhanced DBS certificate. You can get an idea of how a full day author visit might look in this lovely report of a recent visit to Bishop's Stortford College. "Wow! What a fantastic day we had with Helen Moss. The children and staff had a fantastic time learning all about the writing process. Helen made the sessions with the children exciting and engaging. 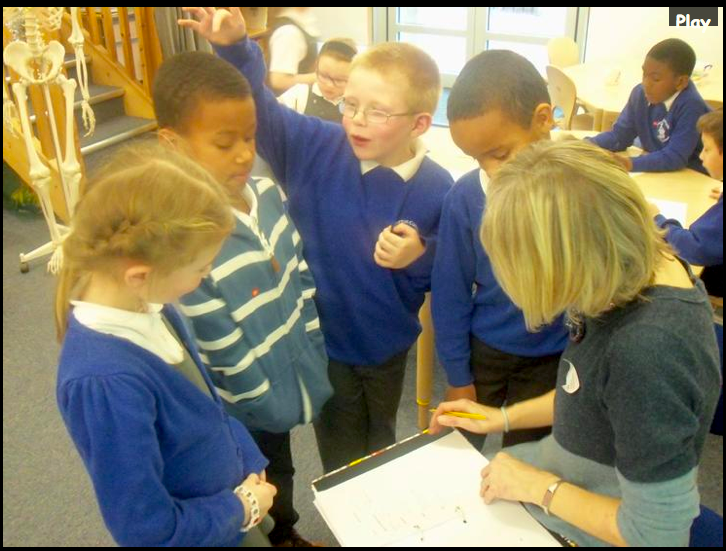 She was willing to answer all the questions the children had and was very personable with both children and staff. 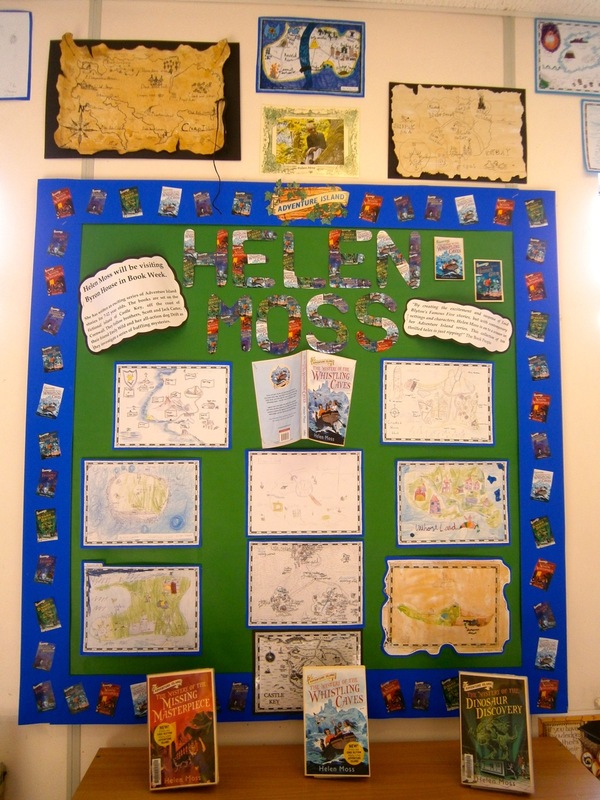 Helen made children very enthusiastic about reading and writing.....the children have not put down their adventure island books since she left! We can't wait for her to return." 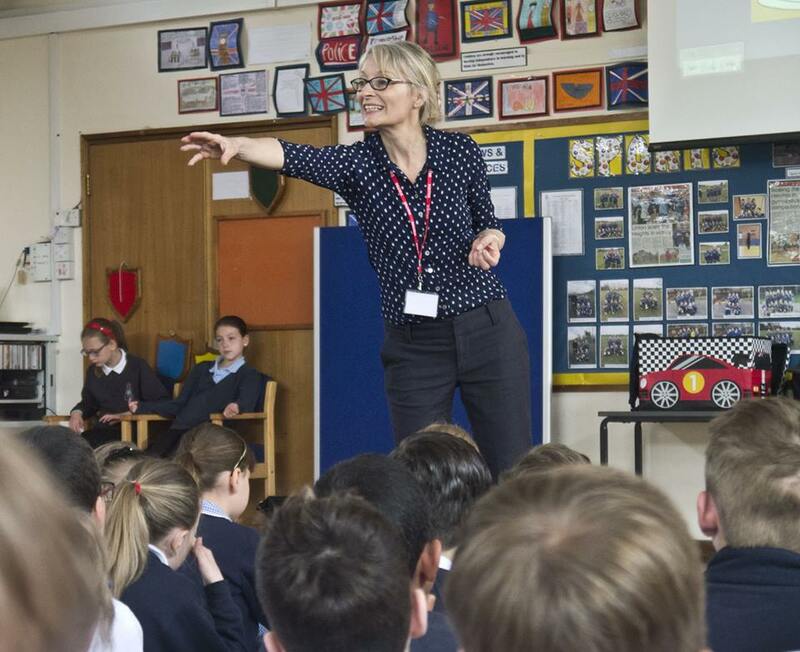 "Helen lead a very intriguing and exciting workshop that captivated the children. Her illustrious writing techniques were immediately applied in class activities and it really helped bring out ideas even from children who are quiet or are not usually confident. 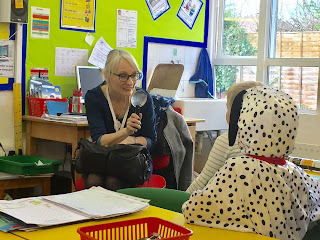 She provided an excellent stimulus for the children and furthermore provided an insight on what it is like to be an author. All in all a fantastic experience." 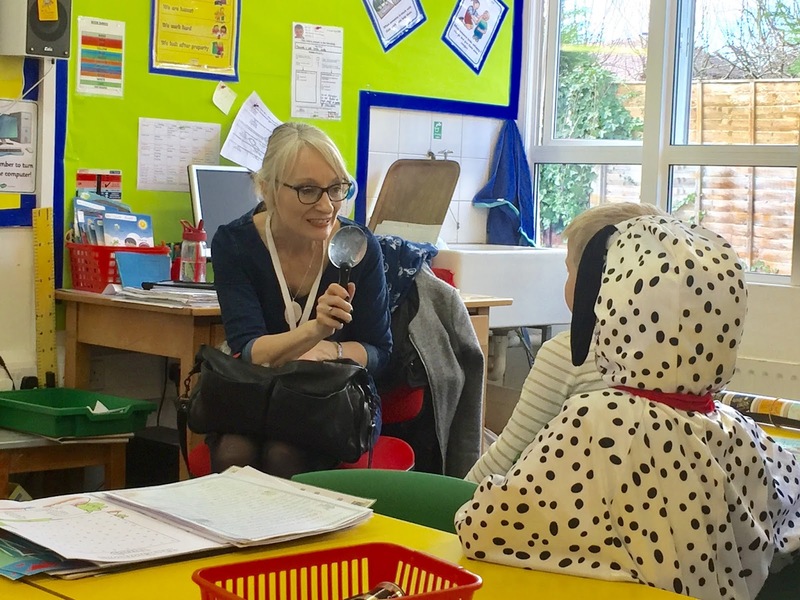 "After a day with Helen, both our children and staff left buzzing with excitement and enthusiasm for writing. For the children to have time to spend not only with an author, but one who can speak to them at their level, engage them and show them the process authors have to go through, is priceless. 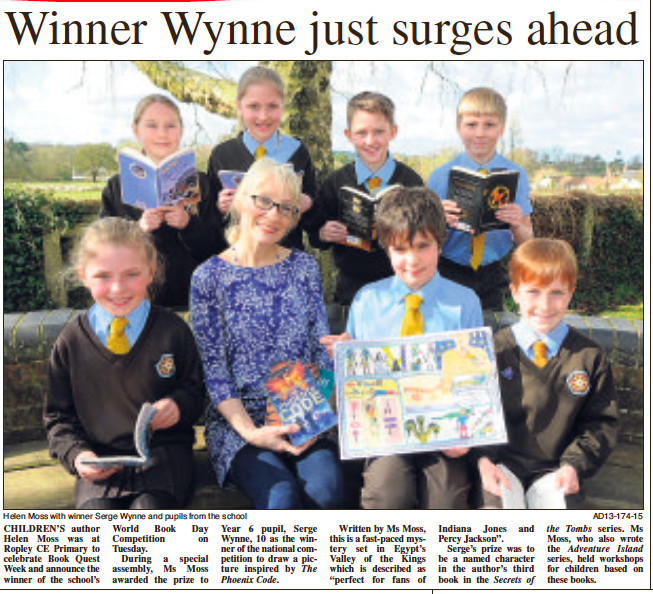 For me, you know the day has been incredibly worthwhile when a girl who 'doesn't like writing' comes in the next day having written a lengthy (and good) story and tells you very proudly she has decided she wants to become an author!" Peter Richardson, Y3 teacher, Walton-le-Dale Primary School, Preston. "Helen is beginning to feel like a friend now after inviting her back three years in a row for our new intake (Y7) students. She is a mixture of passion and professionalism ! Sharing her own adventures as a child with her love of reading and writing and her new recent adventures exploring the faraway countries she visits to do research for her books! She is a wonderful speaker and one we look forward to each October, inspiring the students here to read and write and explore their creative side." “Thank you so much for the wonderful creative writing day that you hosted at our school in October. There was much anticipation amongst the staff and pupils in advance of the day, and I can honestly say that the event lived up to our expectations and so much more! At the whole school assembly at the beginning of the day, you successfully engaged the whole school (from Year 1 to Year 6) with an interactive presentation about your work as an author, your sources of inspiration and the key ingredients to successful mystery and adventure writing. 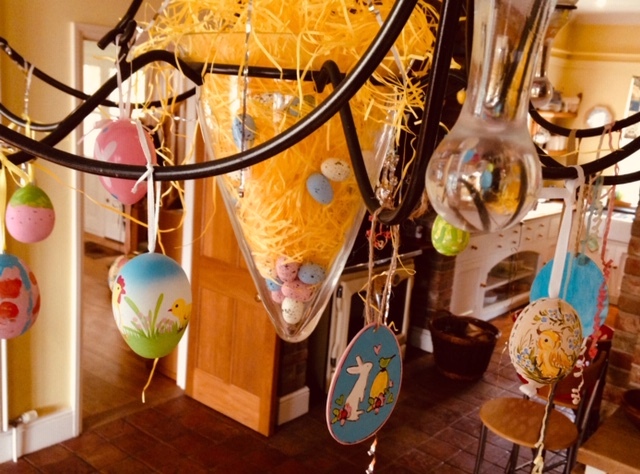 To maintain the focused attention of around 350 children for about 45 minutes was an impressive achievement in itself, but your enthusiastic and approachable style really captivated their imaginations and generated so much creativity throughout the day. Victoria Norman, Head of English, Comberton Village College, Cambridgeshire. Of all the authors in all the years we’ve been inviting them to Meldreth, I have to say that Helen’s visit was undoubtedly the most rewarding. She absolutely engaged the children on their own level warming up with a funny and stimulating presentation before running two writing workshops of exceptional quality which provided the children with tremendous challenge and guidance. 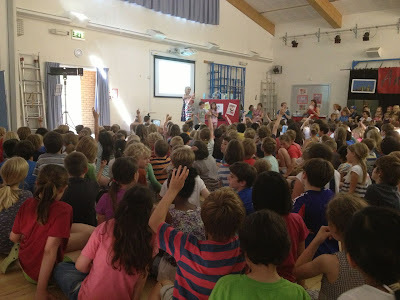 I would be very surprised if we ever have such a relevant and memorable author visit again! Helen visited Denfield Park Primary School on the 18th September 2013 and we had a fabulous day with her. She was very good with our children and valued very child’s response. All the children enjoyed her assembly, where she talked about what inspired her to write. When working with our year 4 and 5, Helen provided good visual pro forma for the children to start writing which was simple and started the ideas flowing. Year 5 were working on creating a dinosaur mystery. They enjoyed hearing about where her ideas came from and were surprised that they were ‘normal’ every day inspirations. 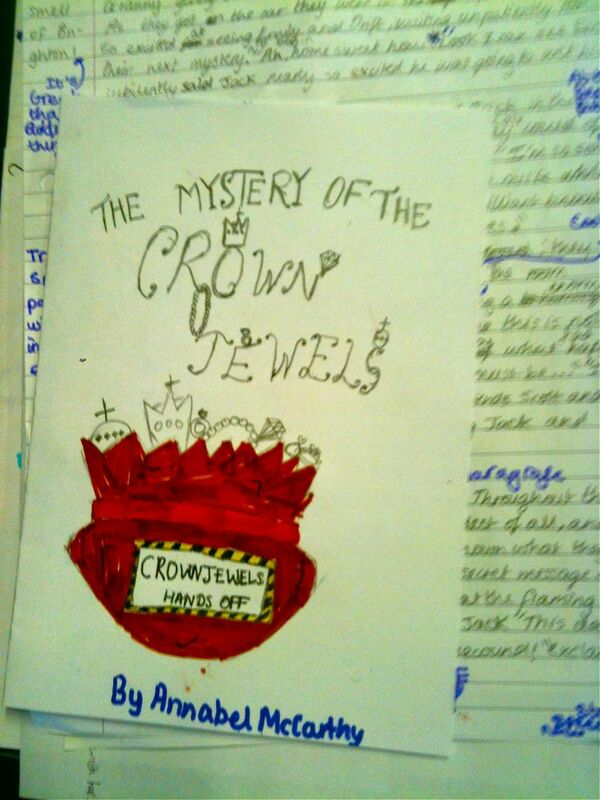 Later, Helen worked with our year 4, using her Flash Fiction 100 word story activity. The children really liked the’ story hat’ activity she used for collecting ideas. They put a character, setting or part of the story on a piece of paper and placed it into the hat. 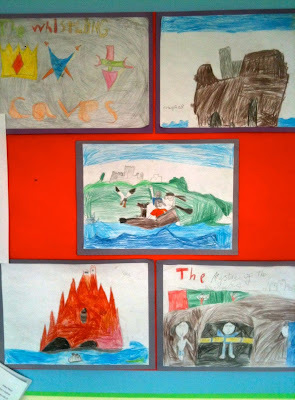 The children then pulled out the ideas to create a story. She engaged the children with her story telling and got them activity involved. Our year 6 meet Helen in the afternoon and asked some interesting questions about being an author. 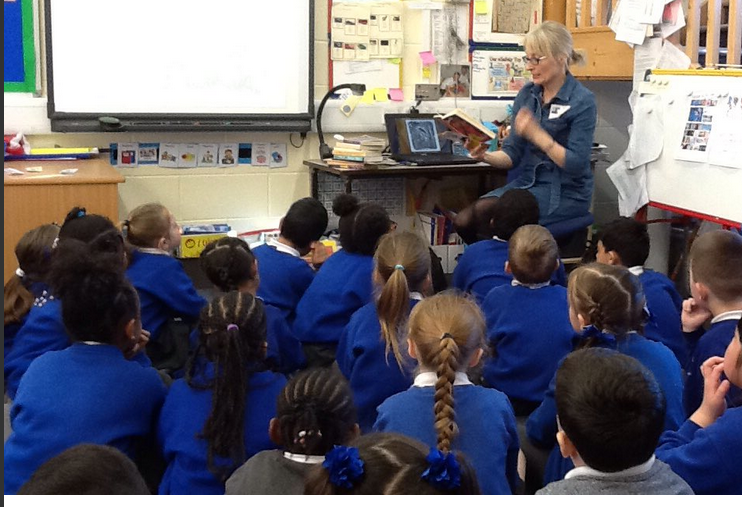 All children enjoyed meeting Helen and were keen to ask her questions about the writing process. At the end of a very busy day Helen stayed and signed books for our children. They were so excited to meet her. A great Day! Thank you Helen. Chatterbooks children and their families had a great time and found your author session to be inspiring, informative and fun. Thank you once again for making our Children's Book of the Year event so special. 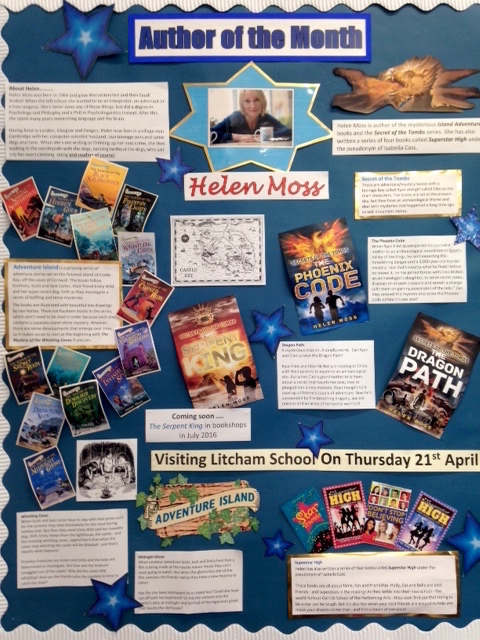 Helen Moss came to our school on Wednesday 28th March to talk to both my Year 5 classes. The children were so excited and enthralled by having a real author in their class. Helen talked about her new book 'Dinosaur Discovery' she explained the writing process and where she had got her ideas from. The children were really interested in the process and were inspired by how Helen researched the topic. Helen also shared an extract from the book, which the children acted out as she read. Helen also spent time with the class completing a creative writing activity using the stimulus of the Dinosaurs, where Helen (with the help of a fun game) helped them to come up with their own dinosaur name. The children were really keen to take part in the activity and those that might normally be reluctant to write, were excited to start straight away. Helen was fantastic with the children and they were so excited by the chance to meet and ask questions of her. Also, these blog posts from Litcham School Norfolk have some lovely student feedback on a recent visit: Y6 students, Y7&9 students. A wonderful wall display by the children of Meldreth Primary School! Thank you to everyone at Meldreth for making this a fab visit!